You can take action to save the plant. On the home page, there are links to Sign the Petition and a link to Contact the Governor. I urge you to follow both links. Also, I encourage you to explore the website, which includes links to news about Fitzpatrick. Go to the Home Page, sign the petition, write an email to the Governor. I am grateful to Oswego Industrial Development Agency for building a page with convenient links--to help us make a difference. Sad side note: Can you imagine any official Windham County governmental organization doing anything to save the jobs at Vermont Yankee? I can't. Looking back at everything, I am amazed by the lack of community feeling in greater Windham County. End note. Since upstate New York has a local movement that is trying to save the plant, let's help them. On November 12, 2015, the Vermont Nuclear Decommissioning Citizens Advisory Panel (NDCAP) held its first public discussion regarding four NDCAP-sourced advisory opinions about controversial aspects of Vermont Yankee decommissioning. The full text of each opinion appears on the NDCAP website. The following comments about each opinion are made with regard to the prompt, safe decommissioning of Vermont Yankee. Fair Representation: At the public hearing, discussion immediately focused on the definition of “host community.” A longtime Vermont Yankee opponent insisted on no special preference for Vernon, the physical host of VY and its strongest supporter. A Vernon panelist noted in response that Vernon will be more impacted than any other community by decommissioning decision making. NDCAP needs to ensure that any new organization fairly and equally represents the actual needs of the host communities, and therefore must not be influenced by political or ideological interests. Financial Support: WRC should clarify: does “supported by” mean financial support? And if so, who pays? The logical choice would be the communities themselves, because they are presumably acting in their own interests. No funding support plan should involve the Decommissioning Trust Fund (DTF). For this reason Entergy, too, should not be billed, because it would likely submit this expense for reimbursement to the DTF as a cost of decommissioning. 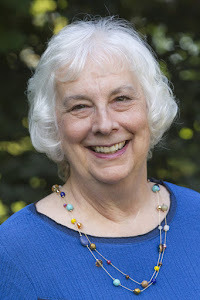 Unless these two issues can be satisfactorily resolved, the responsibility of advising the NRC on behalf of host communities should continue to rest with the individual communities, the NDCAP, and the State of Vermont. Advisory opinion #1 was approved November 12 with minor changes. The three remaining opinions await public discussion. This opinion argues for the elimination of groundwater testing for extremely low concentrations of radiation, as adopted by the State of Vermont in 2014 per a new testing laboratory contract, because it no longer promotes public health or safety. Expensive testing that was valid during the tritium releases and when the reactor was operating is now unnecessary and redundant. Wherever possible, redundant, expensive measures that have outlived their usefulness should be eliminated. The spent fuel opinion would abandon the proposal for a second fuel storage pad (Pad II) adjacent to the current pad, now before the Vermont Public Service Board, in favor of another more distant pad. The opinion alludes to several past statements by Entergy legal counsel and the Public Service Board suggesting that when the intensive physical work of decommissioning begins (possibly in 2032), a third pad may be necessary. The opinion suggest saving time and money over the long haul by building it now. Saving time and money is essential to the prompt, safe decommissioning of Vermont Yankee. That’s why Entergy’s plan for Pad II should proceed. The permitting process alone for another new pad would be time-consuming and expensive. The geological and soil-testing standards and testing are extremely rigorous. Therefore, it is not certain that an approved third pad will be available, much less needed. Meanwhile Vermont Yankee wishes to move the spent fuel into dry cask storage on the proposed Pad II as early as 2017. Most agree that dry casks are the safest, most secure onsite storage configuration. While the fuel pool storage is satisfactory and NRC-approved, Windham County would prefer dry cask storage. It should also be noted that the sooner the fuel is loaded into dry casks, the sooner it can be made transportable, should the federal government finally fulfill its three-decade old promise to claim spent fuel from all reactors nationwide. In short, the sooner spent fuel can be safely moved into dry casks on adjacent pads, the better. The final opinion would require continued funding for the Radiological Emergency Funding Plan (RERP) past its scheduled expiration date in 2016, with the scope of the plan and its cost to be determined by the State of the Vermont and the impacted towns. This also includes Department of Health independent (and redundant) monitoring at the site through the SAFSTOR or dormancy years. 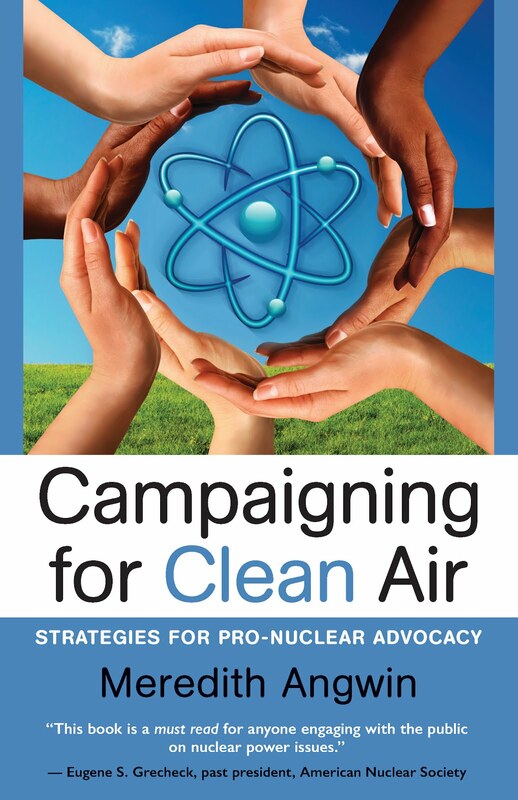 1) Nuclear safety must remain the prerogative of the U.S. Nuclear Regulatory Commission. This is a matter of settled law that the State of Vermont has unsuccessfully challenged once before. The State of Vermont and its communities may and should inform, advise and request, but they must not assume any safety-related decision making authority. The NRC has a seasoned staff of independent safety experts and a strong safety record and should continue to hold responsibility for safety oversight at the plant. In the current and future safety environment, the recommended level of emergency response is unnecessary and overly-expensive. 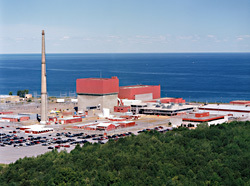 Even though the reactor will be empty and cold, and spent fuel slowly decaying in the fuel pool and dry casks, this opinion would maintain 12 of the 13 RERP emergency response capabilities suitable for an operating nuclear power plant. Furthermore, the State of Vermont and the towns surrounding Vermont Yankee might regard “emergency” funding as a budget-plugging windfall. In fact, Entergy Vermont Yankee will be at about 20% of its operating staff which is largely based on the reduced risk and soon-to-be NRC-approved Emergency Plan changes. 2) Decommissioning would be delayed. This opinion is in conflict with the State’s insistence that unnecessary spending be limited so that the DTF may accrue. According to one Vermont Yankee estimate, continuing the RERP would cost $120 million over a six-year period. As this large sum would almost certainly be withdrawn from the DTF, decommissioning would be significantly delayed. It is important to note that Entergy representatives have repeatedly told NDCAP their company’s reason for business is energy generation, not plant decommissioning. The company’s stated, primary goal for Vermont Yankee isn’t profit, but safe, prompt decommissioning and site restoration. In support of this commitment, Entergy entered into a time-saving Master Settlement Agreement, submitted the PSDAR well before deadline, arranged a $145 million line of credit to streamline spent fuel management, has proposed to move fuel into dry casks by as soon as 2017, and is $5 million under budget in its aggressive campaign to close down non-radiological systems and buildings. James Hansen and the Citizen's Climate Lobby have a plan to gradually add a waste disposal fee to fuels that produce CO2 when burned to produce energy. The plan uses market forces to help properly price energy alternatives so that the full cost is visible. Instead of giving the money to appointed bureaucrats to select recipients, the plan returns all collected money back to citizens in an equal amount per person. Read the post, but pay close attention to the much better than average discussion. How Serious About Climate Change Are We, Really? John Dobken takes on the reasons why opponents claim that nuclear can't help with climate change. There's "can't build them fast enough." Wrong. 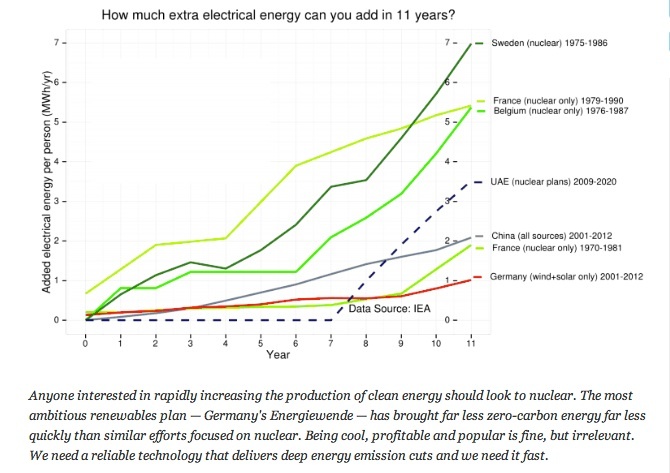 Nuclear has ramped up faster than any other low-carbon source of electricity. There's the "free-market" argument. This argument seems to be suspended when people discuss a wind ramp-up. Dobken's well-illustrated post should be on everyone's quick-reference list for climate change issues. Two significant US vendors, Westinghouse and NuScale, are making serious efforts to develop the market for SMRs in the UK. Solutions are missing. I make a case in a shorter than usual post about doing more than reductions. I suggest reversing CO2. After hearing James Hansen's interview by Amy Goodman on Democracy Now this is very relevant. He talks about "honest" accounting. The idea that fossil fuel companies be held accountable for the costs to environment and society by charging them or fining them for the damages created by their carbon emissions. That is a solution that gets closer to the real problem. Using words like "penalty" and "reward" are more needed. Nuclear needs to be rewarded for clean non-emitting reliable energy. Dirty fossil fuels need to be punished. The title suggests that they would see our choices as foolish. Making poor choices instead of sensible choices makes us seem less advanced than we think. It's back! Fossil fuel burning is on the rise again in New England during the winter. Nitrogen oxide pollution, sulfur dioxide pollution, and carbon emissions are rising right along with it. Graphs from a NESCOE presentation. Talk on interesting “connections" between alcohol or food and radioactivity—particularly, ways in which one can benefit the other. This week, she reports on a new one: a finding that the grains left over from whiskey making may be useful for biosorption of radioactive environmental contaminants. On November 19, Heather Hunt, executive director of NESCOE, gave a presentation to the Northeastern Section meeting of the American Nuclear Society. The presentation was titled New England Infrastructure Challenges. Howard Shaffer and I drove down together, though it is always a bit of a struggle to drive to Boston and back again in an evening. I was especially struck by one slide, showing the trends for carbon dioxide, nitrogen oxides (NOx) and sulfur dioxide (SO2). 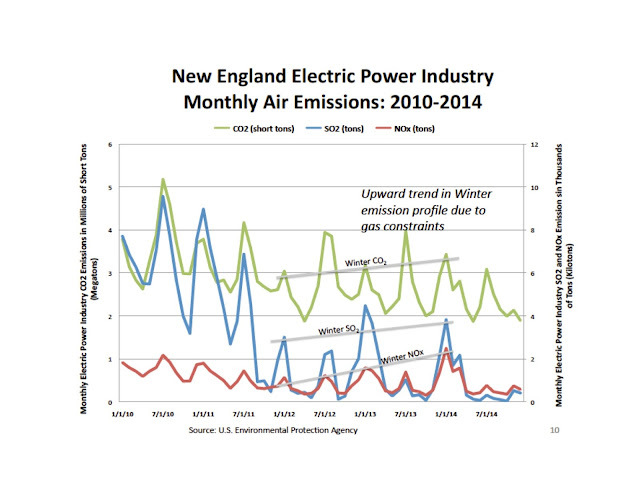 After years of lower pollution in New England, pollution trends from electricity production have reversed. Pollution from the electricity sector is on the rise. The title of the talk was New England Infrastructure Challenges. That is also the answer to the question. For a while, pollution was falling as gas made more power and coal made less. But then the gas constraints hit: there just isn't enough gas available for electricity production in the winter. At that point, the grid operator pulled out all the stops to meet the demand. Coal, diesel, every fossil fuel and its brother were called into play. Some of the fossil fuel plants were called up ad hoc to meet demand, and some were part of the grid operators Winter Reliability Program, which depends on burning oil. I describe this in a post from January 2014. The Cold Truth on the New England Grid This Week, a High-Carbon Fuel Mix. More pipelines for gas, and more transmission lines to Hydro Quebec, could alleviate this gas-crunch problem. But such things take a long time to build. However, it takes a very short time to decide to shut a nuclear plant! Vermont Yankee and Pilgrim will no longer make clean energy for the New England grid. Therefore, the demand for oil-fired and coal-fired and diesel-fired generation will rise during cold snaps, until all the new infrastructure can be built. If the new infrastructure is actually built. The number of people who will lie down in front of "fracked-gas"pipeline construction rivals the number of people who hate nuclear. As a matter of fact, they are often the same people. I recognize some of them at meetings. New England is going backwards to the future. NESCOE is the New England States Committee on Electricity. The important word is States. This is a small committee, with members appointed by the Governors of the New England States. It keeps track of electricity issues as the states would perceive them. I think NESCOE is a very good idea. Without it, the states would be individual and alone in trying to understand the implications of ISO-NE decisions. 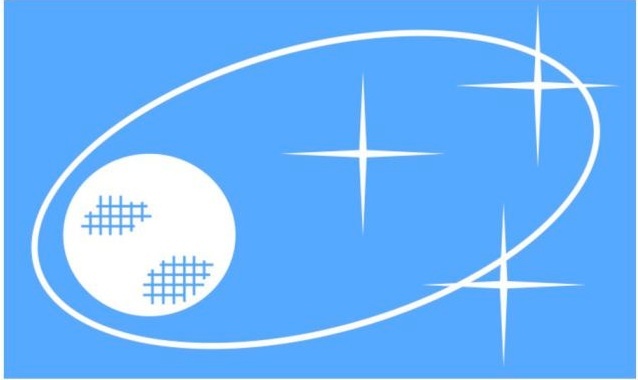 (ISO-NE is the grid operator.) Heather Hunt is the Executive Director of NESCOE. I appreciate her courtesy in sending me the slide above. As it happens, I will see Hunt again tomorrow. I am a member of the Coordinating Committee of the Consumer Liaison Group (CLG) for ISO-NE. We are meeting in Boston tomorrow, and Hunt will be on the panel at our meeting. Attendance is free: I encourage you to attend. 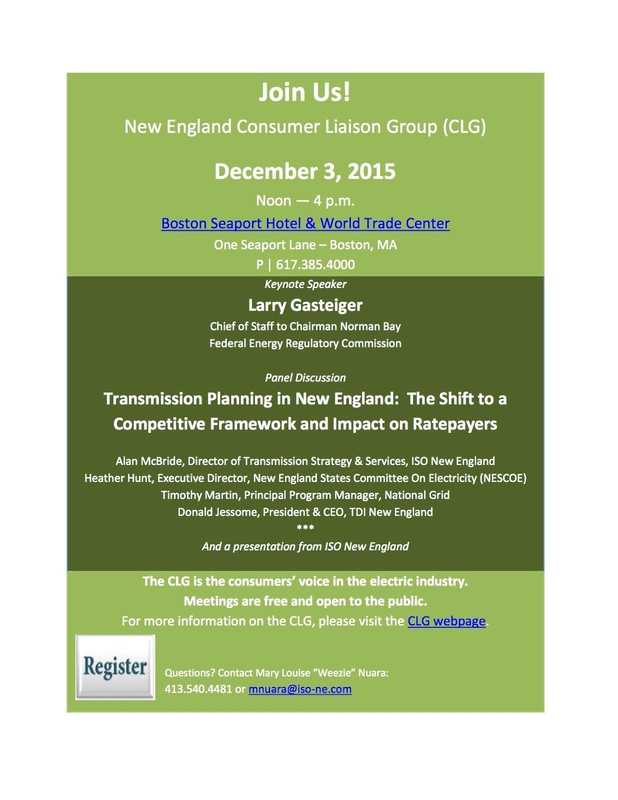 The subject is Transmission Planning in New England. I share the announcement below, and you can find more information at the CLG web page for the meeting.